The Body Shop Almond Hand & Nail Cream | £5 for 30ml or £11 for 100ml // I love almond scented products but I was a bit disappointed in the scent of this one which is unusual for TBS products. I imagined and hoped it would be a marzipan type of scent but it’s more of a nutty almond scent, if you see what I mean. As far as the cream itself goes it’s nice for an everyday while in the office type of hand cream but it isn’t thick enough to be used at night. As it has a lighter formula, it does sink in quickly and my hands aren’t left feeling sticky or greasy. I wish I had tried this in store before I bought it online as I probably wouldn’t have bought it. I do love the metal packaging but I say skip this and try the Hemp Hand Protector instead, one of my all time favourites. The Body Shop Africa Honey & Beeswax Hands & Foot Butter | £10 // Let me start with the packaging, apart from the metal tubes TBS offer, this has to be one of my favourites. It has a very thick almost butter like consistency which means it is incredibly moisturising and makes ther perfect overnight treatment. Apply some of this and pop on a pair of cotton gloves or socks and you’ll wake up with incredibly soft skin in the morning. I find this really helps with the eczema on my hands and feet and after a few applications it’s pretty much gone. It has quite a subtle honey scent which makes a change from other products that I use but one that I really like. 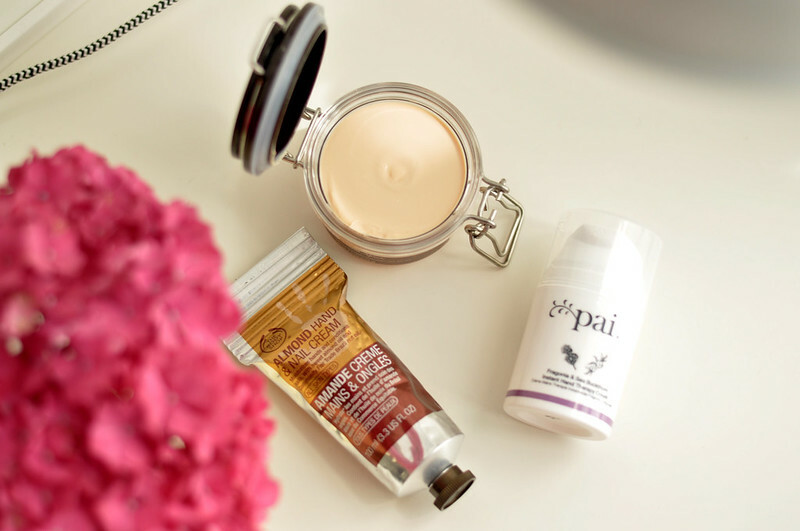 Pai Fragonia & Seabuckthorn Hand Cream | £16 // I originally bought this as I thought it would be a good hand cream to use when the eczema on my hands flared up. Unfortunately there was something in it that irritated my skin even more than it already was. I have no idea what it was that irritated my skin, it doesn’t contain added fragrance so I can’t even blame it on that. It could simply be a coincidence that my eczema got worse but I stopped using it until the flare up had disappeared. Once my skin settled down and I was able to use this hand cream again without any irritation, I really liked it. It has a slightly thicker than normal formula which meant it was perfect to use at night. The pump packaging also meant I was using just the right amount of product and my hands never felt too greasy even if I was only going to bed. It’s a bit of a mixed product for me and probably because more often than not I have eczema flare ups on my hands I probably won’t buy another tube unless this changes. I love that hand and nail cream! Although nothing can quite compare to the Caudalie one.